Having crossed much of Turkey on the way from the Iraqi border in the far south-west to central Anatolia, I arrive in the capital, Ankara. 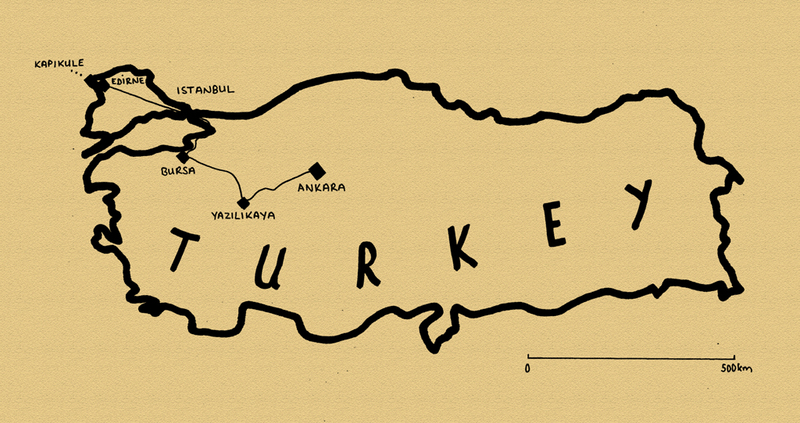 The last two weeks of my 2014 journey will take me from here across western Turkey, past monuments of the semi-legendary Phrygians, then through three former Ottoman capitals; attractively sited Bursa; Istanbul, one of the very finest cities in the world and Edirne on Turkey’s frontier with the EU. Whilst not as ruggedly beautiful or culturally varied as the country’s east, this short journey across Turkey’s modern, western face would reveal much of the history of the Byzantine and Ottoman Empires, which together stretched from Antiquity until the early twentieth century. It’s the 2nd November 2014 as I enter Ankara from the east on a cold, clear night, driving across the city centre to the home of my friend İnanç. I first met İnanç more than seven years ago at the very beginning of the Odyssey when he hosted me for a few memorable days in Almaty, Kazakhstan where he was working as a construction engineer. Following several years working in Kazakhstan and Russia, then travelling, İnanç has recently returned to his parents’ home in Turkey and will now be my host in his native Ankara. Ankara is an ancient settlement and was known to the Hittites and Phrygians, but it was during Roman times that the city flourished, lying in the heart of Anatolia at the junction of north-south and east-west trade routes. In Ottoman times it languished as something as a backwater, but it would be made the base of an interim Turkish government by Mustafa Kemal during the Turkish War of Independence, when the Allied Powers sought to partition the Ottoman Empire among themselves. Following his victory, in which he retained the Ottoman territory in Anatolia to form the new Turkish Republic, Mustafa Kemal made Ankara its capital in 1923. We start late the following morning and head for the centre of the city, which is filled with government buildings, company headquarters and bustling streets of commuters. It’s an attractive and well-organised place but is very clearly a modern, purpose-built capital, without the romance or beauty of Istanbul. Overlooking the centre of town is ancient Ankara Castle, and we walk up steep steps through vivid yellow horse-chestnut trees and pass through a gate in the castle walls which seem to have been repaired at some point with what look to be recycled Roman gravestones. 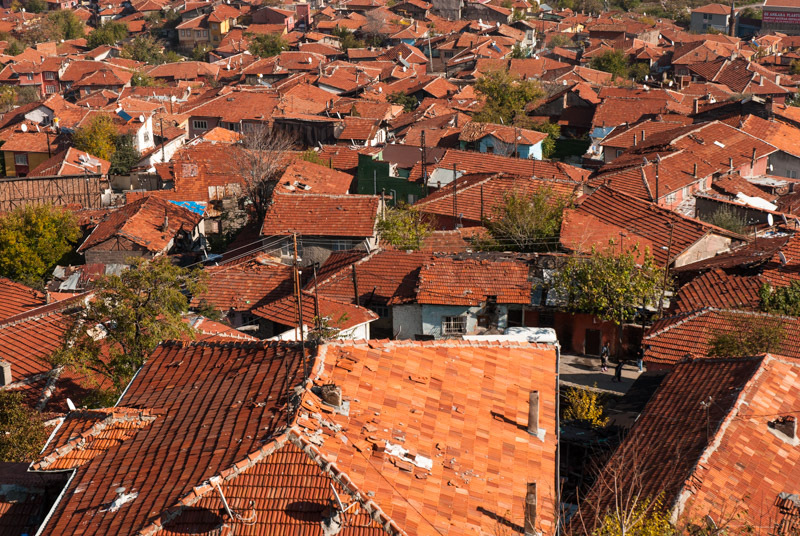 From the top one has a wonderful view over the winding streets of Ankara’s old centre, a sea of terracotta-roofed houses rather like an up-scaled Anatolian village. In the afternoon, we walk across the centre to visit the mausoleum complex of Turkey’s founder, which is known as Anıtkabir (Memorial Tomb). When the victorious Mustafa Kemal set up the modern Turkish republic from the ashes of the Ottoman Empire, he introduced stringent political, economic and cultural reforms, forging a republic based on secularism and nationalism rather than religion. In 1934 he was given the name Atatürk (Father of Turks) by the Grand National Assembly and was central to the progress and identity of this young nation state. It was mostly after his early death in 1938 however that his name and portrait, with high hairline, piercing blue eyes and upswept eyebrows, was turned into something of a cult of personality which very much persists to the current day, even with the country currently seeming to fall back towards religious conservatism. One approaches Anıtkabir through a large manicured park along the Road of Lions with replicas of Hittite Lions representing power and peace, from a pre-Islamic, Anatolian civilisation whose borders were similar to those of modern Turkey. 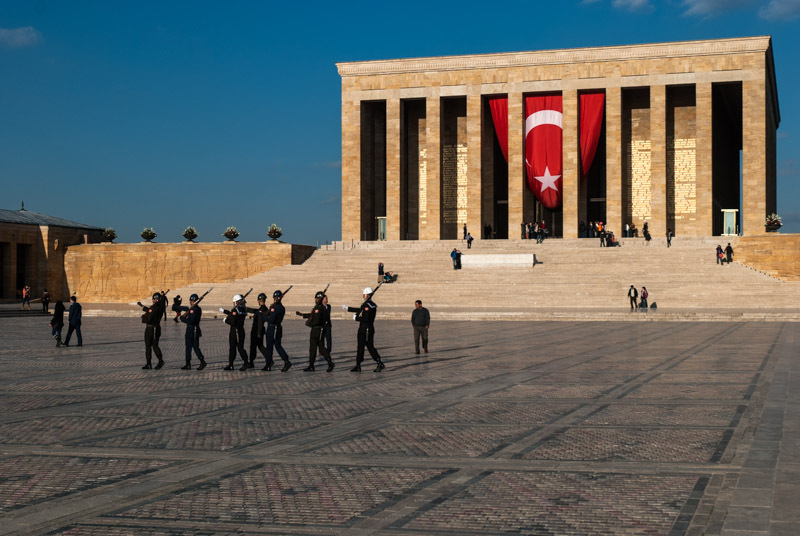 One then reaches the huge Ceremonial Plaza whose perimeter is lined with long, colonnaded galleries and whose floor is an expanse of polished stone drawing the eye to the imposing Hall of Honour, the actual mausoleum of Atatürk which sits on a stepped pedestal like a modernist temple. In the plaza mill tourists, groups of schoolchildren and troops of guards but the human form is dwarfed by its size and the vertical pillars of the mausoleum behind which is draped a huge Turkish flag. Inside are exhibits from Atatürk’s remarkable political career but his tomb, in a forty ton sarcophagus, is not on public display. In the evening, I am invited by İnanç and his parents to a large family gathering and end a great day in the company of his extended family eating excellent food and wishing I could speak some Turkish. In the morning we head back into the city centre to visit the Museum of Anatolian Civilisations. Here, in one of the best museums I can remember visiting, one finds a plethora of artefacts from archaeological sites and ancient buildings across Anatolia. Most impressive are a collection of Hittite bronzes, particularly the distinctive ‘sun discs’ from nearby Alacahöyük. There are also Bronze Age female fertility idols, Hittite pottery, Phrygian earthenware, reliefs from the Neo-Hittite and Assyrian Empires, a carving of Assyrian King Mutallu and Urartian ivories, among many others, which keep me rapt in the museum until closing time. 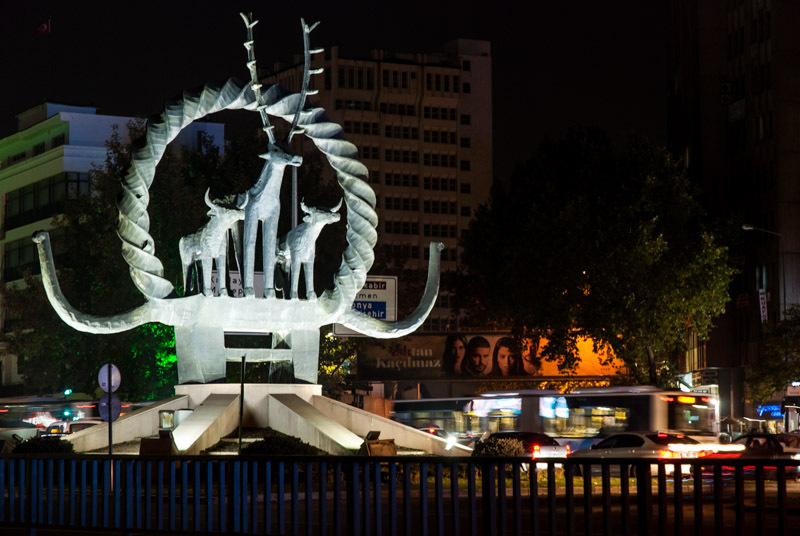 One sees touches of these ancient civilisations across modern Ankara, such as the large Hittite Sun Course Monument in Sihhiye Square, depicting a stag with stylised horns seen in Bronze Age petroglyphs as far away as Mongolia. Before leaving Ankara, I pay a visit to another friend, Ezgi, a course-mate from my Masters degree in London who now works for the state oil company. A native of Istanbul, she tells me she finds Ankara rather dull and provincial, a far cry from vibrant Istanbul. İnanç and I leave Ankara together, heading south-west out into the beautiful Anatolian countryside on a mild and cloudless day. We pass Polatlı, close to the ancient Phrygian capital of Gordion, home of the legendary Gordian Knot. Tied by farmer-come-king Gordias, an oracle had foreseen that the knot would be undone by a man destined to become king of all Asia and it was supposedly sliced open by Alexander the Great on his march east towards Persia. We turn off the highway and onto small provincial roads, stopping in the town of Çifteler for lunch at a lokanta (canteen) and continuing to the village of Yazılı. 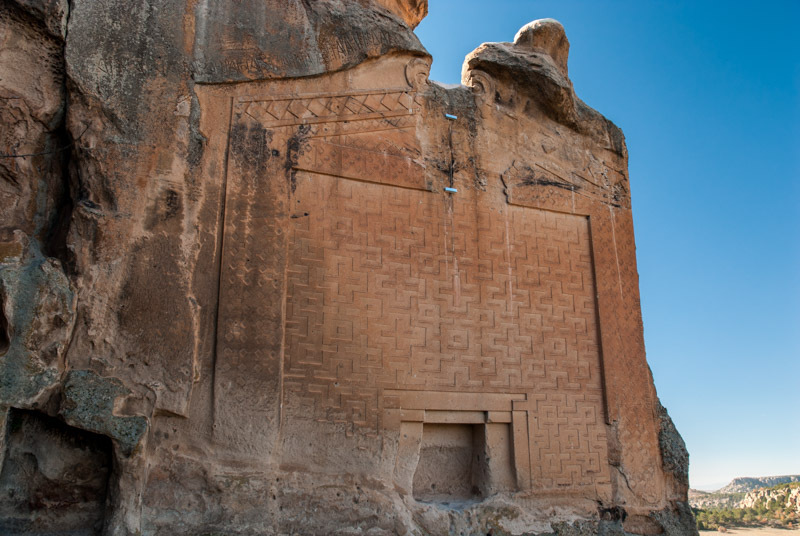 Set amongst soft outcrops of yellow limestone, overlooking a small wooded gorge, Yazılı lies just below the Midas Monument, perhaps the best preserved of all Phrygian sites. The Phrygians had a kingdom here in south-central Anatolia during Antiquity, but their origins go beyond the limits of history and into legend, such as that of the Knot, or of King Midas, son of Gordias, who turned to gold anything which he touched. The Midas Monument is in fact attributed to a historical, eight century BCE King Midas and is a rock-hewn sanctuary, thought to have been dedicated to the Phrygian Mother Goddess Cybele, who would later be adopted into the Greek and Roman pantheons. The sanctuary is imposing in size and beautifully carved with geometric patterns and an inscriptions in the striking Phrygian script, but nothing remains of any goddess. Around the beautifully located site are several other carved sanctuaries and altars, though they are heavily weathered; but it’s a nice day to walk around the beautiful hillsides in peace. On our way back to the main road we pass two further Phrygian sites: Areyastis, a similar rock-hewn sanctuary with very clear inscriptions, and the rock-cut tomb of Gerdek Kaya, with two Doric columns, reminding me that I am edging closer to Hellenic World and Europe. We stop after dark in the city of Eskişehir, which İnanç tells me has one of the highest standards of living in Turkey and a large student population. It is also where İnanç wishes to settle and start up a business with a friend. There’s certainly a degree of European order and calm, but I don’t intend to stay, so after a drink in a café, we say goodbye once more. I continue west, passing close to the town of Söğüt where in 1299, Osman, leader of a tribe of nomadic Turks, founded in somewhat unclear circumstances what would become the Ottoman Empire. The road then crosses a mountain range and I descend into a broad valley in which lies Turkey’s fourth-largest city, Bursa. I am hosted in Bursa by Füsun, a research assistant who lives in the city’s western suburbs. On top of the experience of being hosted by a young (and very attractive), single woman living alone, I find myself experiencing considerable culture-shock as I wait at a metro station in this modern suburb, in the middle of a frantically busy six lane highway. I am now truly in Turkey’s modern west and the contrast with the small, chaotic and conservative cities of the east is quite breathtaking. However, after taking the metro to the city’s ancient centre, I am reassured that beyond the modernity, Bursa, the first true capital city of the Ottoman Empire, retains its centuries-old character, a juxtaposition which for me is amongst Turkey’s greatest draws. I start my exploration of the city in the busy central bazaar area, centred around the late fourteenth century Grand Mosque, an example of early, Seljuk-influenced Ottoman architecture. Inside the mosque is a central ablutions fountain illuminated by a large ocular skylight; a pleasant change from the usual artificial lighting. 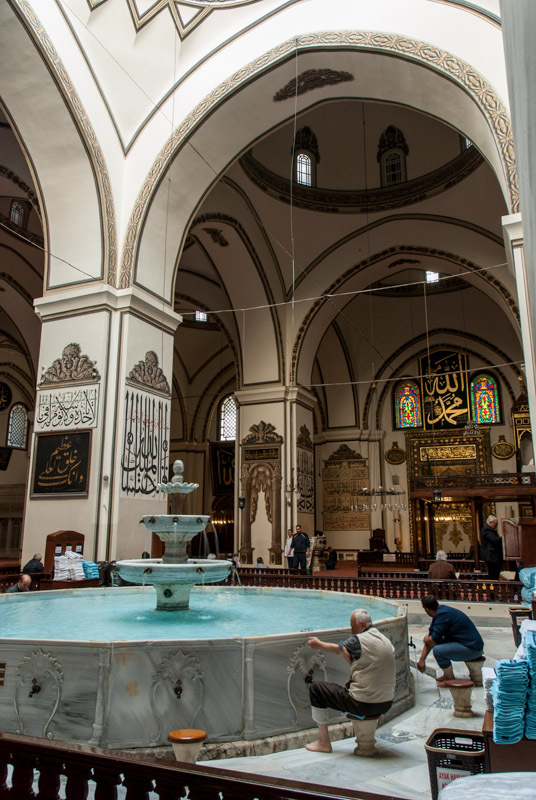 The mosque is however more than just a place of worship, forming part of a külliye, a typically Ottoman institution which includes school, hospital, kitchen and communal baths into a single religious and charitable complex. One might at first imagine that the nomadic Turkish tribes raiding and laying siege to the fringes of Byzantium would have been a group of half-savage horsemen, but this is clearly completely at odds with the glorious works of civil architecture which they soon erected in their capital and the speed with which they synthesised elements of civilised Byzantine culture. Not far from the mosque are several arcaded shopping centres and khans (caravanserais), my favourite being the Koza (silk) Khan whose open courtyard, once a medieval marketplace is now a wonderful café where one can sit amidst tall çinar (plane) trees and take respite from the busy streets of the bazaar. 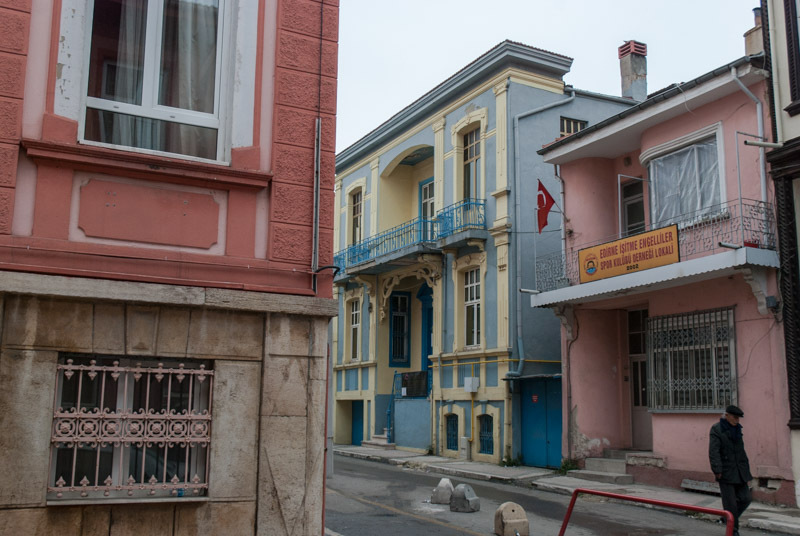 On the upper floor, in small, cell-like chambers which would once have housed travelling merchants, real businesses remain; traders and insurance agents; small, smoke-filled offices with suited men, sipping tea from tulip glasses and thumbing tespih (rosary beads) under yellowing portraits of Atatürk. Away from the immediate bazaar area are several more mosques, tombs and külliye which seem popular with visitors from across the Islamic World, though nowhere does Bursa fell like a tourist trap. Walking up steep streets in the southern part of the city centre, I see the beautiful, green mountains on whose flanks the city has been established and finish the day by walking through the district of Tophane, which has many pleasant corners and a clutch of preserved nineteenth century, wood-framed Ottoman town-houses amid the usual twentieth century concrete. I leave Bursa in the morning, driving down to the Sea of Marmara and around the shores of a long inlet, through the city of İzmit which was devastated by an earthquake in 1999 and onto the D100, Turkey’s main east-west highway. As the road widens and the traffic thickens, I am drawn through concrete satellite towns into the outskirts of Istanbul, one of the world’s largest and in my opinion also finest cities. I park the car beneath an apartment complex belonging to a friend-of-a-friend and continue by metro, crossing first the Bosphorus into Europe (back for the first time since crossing the Ural River in Kazakhstan five months ago), then the Golden Horn, into the district of Fatih, the historic heart of the city where I have hired a hotel room for five nights. In the evening, I am joined by Lia with whom I had spent two weeks in Georgia, back in August. We are based in the neighbourhood of Sultanahmet, in the very heart of the historical Istanbul where in around 660 BCE Greek settlers from Megara founded the city, then known as Byzantion (Byzantium). It’s just a hundred metres from the hotel to the sea shore and here one starts to appreciate the city’s location; astride the narrow strait which separates Europe from Asia and is the only access route to the Black Sea. No matter the man-made wonders of Istanbul, one is always drawn to the gleaming waters of the Bosphorus which, even in this age of cheap aviation and private cars, still teems with passenger ferries as well as container ships, tankers and fishing boats. This strategic location is the basis of the city’s success, controlling the flow of people and goods between Europe and Asia; a location which made it the continuous capital of an empire for very nearly sixteen centuries. As the Roman Empire went into terminal instability and decline across Europe, the Emperor Constantine emerged as its sole ruler in 324 CE and moved the capital to Byzantium in 330, which became known as Constantinople. Thus started the shift from Rome (where the Western Roman Empire would collapse in the fifth century) to the east. Constantine legalised Christianity and built up Constantinople into the great city which it continues to be. This old heart of Istanbul, now known as the district of Fatih, corresponds to the old walled city and we begin by walking a route following the ancient Sea Wall along the Propontis (Sea of Marmara), rounding the promontory which separates the Bosphorus from the Golden Horn, below the ancient hill of Sarayburnu (Seraglio Point) where the first Greek settlers founded the city and where the Topkapı Palace now stands, for centuries home of the Ottoman Sultans. Around here the walls give out, lost below centuries of construction and reconstruction and we reach the waterfront neighbourhood of Eminönü, the city’s most important ferry dock. 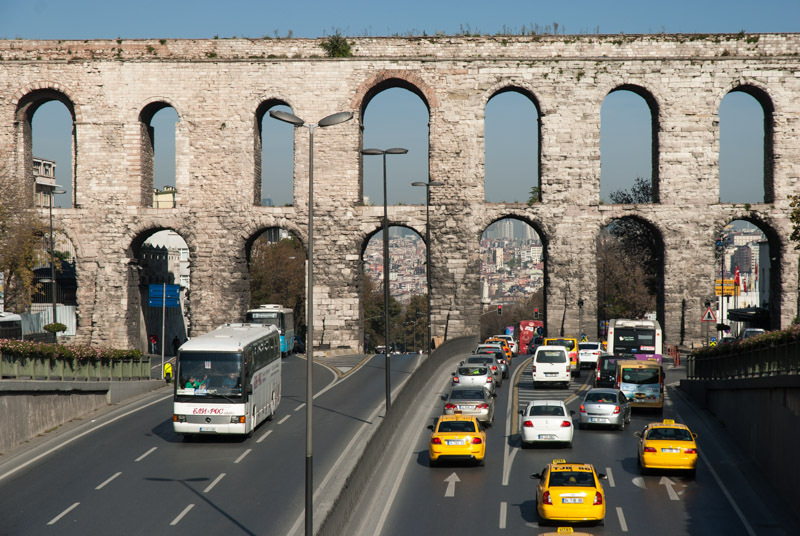 Turning inland up Atatürk Avenue, we climb and pass one of the city’s greatest secular Byzantine landmarks, the Valens Aqueduct, built in the fourth century to supply Constantinople with water and through whose arches the endless traffic of modern Istanbul still passes. Heading roughly north, we pass the beautiful Ottoman-era Fatih Mosque, with its türbe (mausoleum) of Sultan Mehmed II, founder of Ottoman Istanbul. We wander through the adjacent bazaar and descend steeply downhill through the traditionally Jewish neighbourhood of Balat, where there is far less traffic and where children kick footballs in the narrow, cobblestone streets which seem to be in the perpetual shade of overhanging pastel-coloured buildings. We’re soon back at the Golden Horn and pick up the city walls once more; this time the Wall of Blachernae which still carry the Byzantine name of this district. Today it’s a rather run-down area which still has the occasional wooden Ottoman-era house, often derelict with boarded windows, remnants of the twentieth century decay of the great empire. We emerge from the walls at Eğri Gate and find ourselves on the edge of ancient Constantinople, walking through a quiet park at the base of the Theodosian Walls. These defensive walls were built in the late fourth century in the time of Emperor Theodosius who made Christianity the state religion of the Byzantine Empire and Constantinople the most important city in Christendom. We climb the walls for a fantastic view across the city; over the roofs of the streets we have just walked through, across the Golden Horn to the district of Beyoğlu and up the Bosphorus to the skyscrapers of Levent, Istanbul’s modern business district. 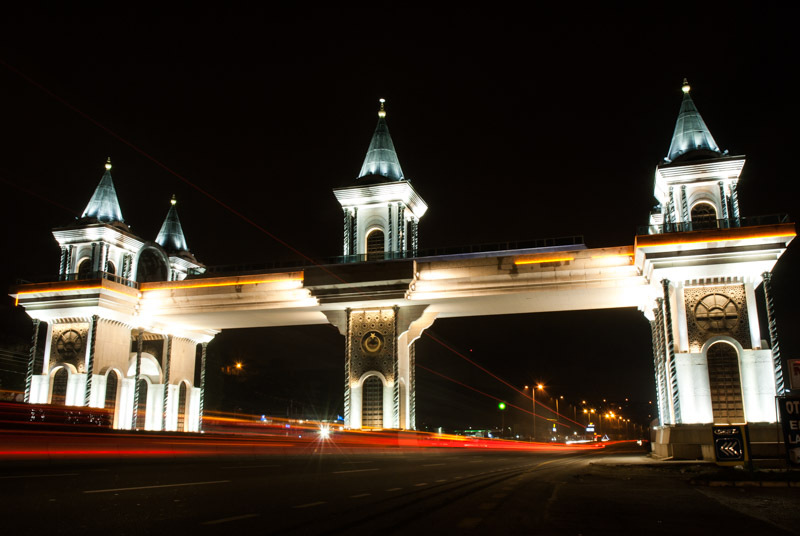 Finally we re-enter Constantinople through Edirne Gate and make our way back to the hotel. The next day, we set out to look at Istanbul’s Ottoman endowments which, after the Bosphorus, are surely the city’s most distinctive feature. After the Byzantine Empire reached its zenith in around the sixth century, when it controlled much of southern Europe, the Levant and North Africa, it experienced cycles of decline and recovery; weakened by war with Sassanid Persia, invasions by the Arabs and the loss of much of Anatolia to the Seljuk Turks. After a recovery in the twelfth century, Constantinople was plundered and temporarily occupied by Venetian-led Catholic crusaders from Western Europe, which led to terminal fragmentation and decline. As the newly emerged Ottomans established themselves in the fourteenth century, they conquered Byzantine territory in Anatolia and the Balkans, surrounding the by now ailing and depopulated capital. Finally, in 1453, under Sultan Mehmed II, ‘The Conqueror’, the Ottomans took the city, bringing to an end the Byzantine Empire, and swiftly began to build Constantinople up into a magnificent imperial capital once again; a new centre of the Islamic world. We walk up through the old streets of Sultanahmet to one of Constantinople’s oldest thoroughfares, now the tram line running down to the Golden Horn, where the rather battered remains of the Column of Constantine mark the site where the city was founded almost 1700 years ago. Nearby is the mosque of Gazi Atik Ali Pasha, dating from the reign of Sultan Beyazid II, son of Mehmed the Conqueror and behind that, the entrance to Istanbul’s ancient bazaar. We walk past ancient khans on streets worn smooth by the passage of feet but almost empty on a Sunday, up to the Third Hill on which is located Istanbul’s largest and most impressive Ottoman Mosque. Built by the legendary architect Mimar Sinan, a Janissary (Christian slave conscript) of most likely Armenian descent, the Süleymaniye Mosque is a külliye built for Sultan Suleiman, a stunningly intricate structure with four piercing minarets, distinct from, but clearly owing many architectural elements to the Byzantine Hagia Sophia. Known as ‘The Magnificent’ or ‘The Law-Giver’, Suleiman oversaw the expansion of the Ottoman Empire to its greatest extent; from Hungary to Persia and south to Egypt and the Hejaz, and forged a truly multicultural empire, welcoming Christians and Jews as well as Muslims to settle in his illustrious capital. We walk back towards Sultanahmet in order to make a comparison with the Sultan Ahmed Mosque, which is of very similar design, having been built by a pupil of Sinan; slightly smaller, but with a more decorative interior. Facing the Hagia Sophia, the Sultan Ahmed Mosque was built for Sultan Ahmed II, who oversaw an Ottoman Empire which struggled to keep its new dominions and had reduced in size since the time of Suleiman. He is also notable for having eliminated the repugnant practice of fratricide within the royal family, though this reform would open the doors to shorter, more contested reigns of future sultans, which ultimately compromised the strength of the empire. Crossing the Golden Horn, we leave old Constantinople, coming to the more modern district of Beşiktaş. Walking along Chamber of Deputies Avenue, planted with beautiful mature plane trees between which are strung large Turkish flags, which flutter above relentless traffic, one comes across the Dolmabahçe Palace and Mosque. The seventeenth and early eighteenth century seem to have been a time of relative stability for the Ottomans, but by the end of the eighteenth century, cracks were starting to appear. The empire, once made strong by expansionism and an unbeatable military, was falling behind more modern European empires. A time of reforms was ushered in, known as Tanzimat and the Dolmabahçe Palace was a move away from the old ways. Built by an Armenian architect, the style is recognisably Ottoman but with clear contemporary European touches of Baroque and Rococo. The project was however ruinously expensive and contributed to the near bankruptcy of an empire which by the late nineteenth century had become riddled with corruption. Siding with the losing powers in World War I, the Ottoman Empire came to an end with the indignity of division between European powers, the disgrace of widespread ethnic cleansing and the total dissolution of the dynasty by Atatürk upon the founding of the Turkish Republic. 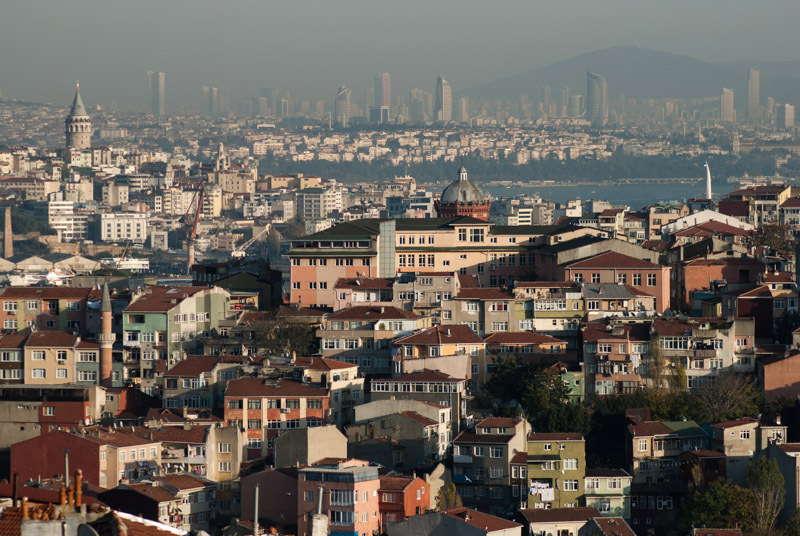 Walking inland from the palace, we enter some of Istanbul’s most upmarket areas in Beşiktaş and Şişli, with streets of boutique shops and expensive imported cars. The streets narrow and steepen as one moves westwards, back into Beyoğlu where we eventually reach the huge expanse of Taksim Square, the heart of modern Istanbul. 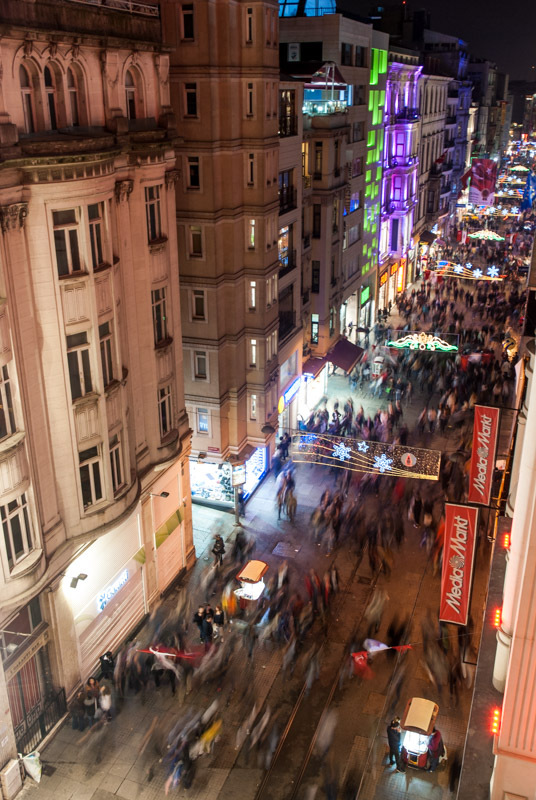 We turn onto İstiklal Avenue which runs back down towards the Golden Horn and is thronging with strolling families, couples and groups of youths. These are the generations enjoying Turkey’s twenty-first century prosperity, removed from the decay and humiliation of the fallen Ottoman Empire, the turmoil of the twentieth century and, perhaps, the hüzün (melancholy) which Orhan Pamuk describes as being innate to the city’s population in his seductively melancholic, semi-autobiographical novel, Istanbul: Memories and the city. 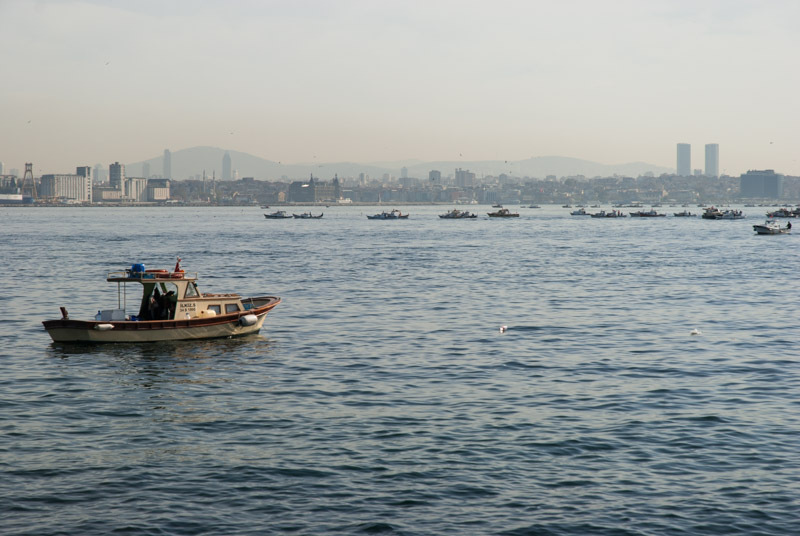 On our third day in Istanbul, we take a tour of the Bosphorus, a trip peddled by almost every tout in the city, but which is genuinely enjoyable and gives an impression of Istanbul’s setting which one cannot get from walking around the disjointed districts. We set off in the morning from Eminönü onto a Bosphorus buzzing with ferries packed with Monday-morning commuters; only in Bangladesh have I seen busier ferry traffic. It’s a real pleasure to sit back and watch Istanbul pass; the waterfront of Beyoğlu, crowned with the conical-roofed Genoese Galata Tower; the ferry port of Karaköy; the late-Ottoman style Cihangir Mosque; the Dolmabahçe Mosque and waterfront Palace, a tremendously elegant building which can only really be appreciated from the water. Then comes the Neo-Baroque and Ottoman fusion of the small but very fine Ortaköy Mosque, whose white stone exterior gleams in the morning sun which has come out, now that we’ve left the pall of smog hanging over the city centre. 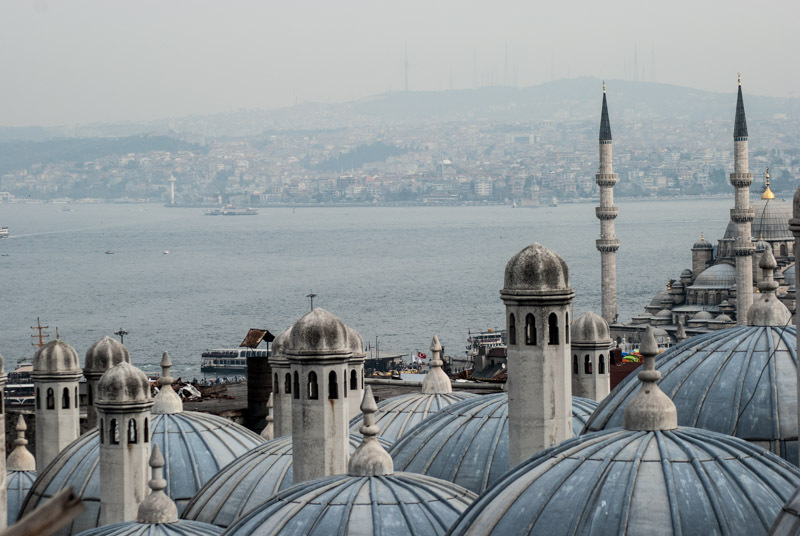 The mosque is however now dwarfed by the nearby Bosphorus Bridge, the first bridge to link the European and Asian sides of Istanbul, which opened in 1973. Beyond the first bridge the European shore becomes less densely populated but is dotted with beautiful yalıs; waterfront mansions dating to the Ottoman-era, owned by rich families as a getaway from their urban konak homes. Next is the fortress of Rumelihisarı, the ‘Strait Cutter’ castle built by Mehmed The Conqueror at great speed in 1452. Together with the older Anadoluhisarı on the opposite, Asian shore of the Bosphorus, the fortress created a vital pinch-point to cut-off all supplies to helpless Constantinople, which had long been surrounded by Ottoman territory. 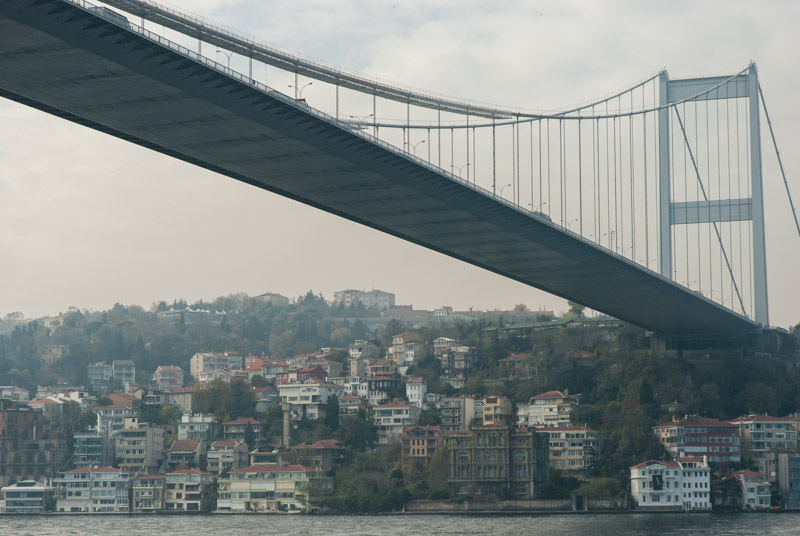 We pass under the Fatih Sultan Mehmet Bridge, the second to cross the Bosphorus, which opened in 1988, then cruise along the shore to the dock at Sarıyer, which looks as if it were a quiet village until relatively recently. Crossing towards the Asian shore, we leave metropolitan Istanbul and are deposited in the fishing village of Anadolu Kavağı; an attractive clutch of waterfront homes set under a promontory. Walking up to the head of the promontory, one finds the Ottoman Yoros Castle, long fought over by the Byzantines, Ottomans and Genoese and which commands a fantastic view towards the entrance to the Black Sea where a steady stream of container ships and tankers are heading towards the ports of Bulgaria, Romania, Ukraine, Russia, Georgia and northern Turkey. Back on the ferry, the return journey takes the same route, this time in the lengthening late afternoon sun, and as we near the Golden Horn we are treated to a heart-stopping view of Istanbul’s unmistakable skyline; low-rise buildings spread across the soft European hills, dotted with the needle-like minarets of the imperial Ottoman mosques. As the sun lowers itself behind the New Mosque in Eminönü, conceived by the scheming wife of Sultan Murad III with the intention of diluting the predominantly Jewish population of the surrounding neighbourhood, we are presented with an almost impossibly romantic view, and I am left with little doubt that Istanbul has the finest skyline of any city. Each time I am in Istanbul I feel drawn to the Bosphorus and find myself taking ferries across it with no specific destination in mind. Thus in the evening, despite having spent most of the day on ferries, we take another across to the dock at Kadıköy on the Asian shore. 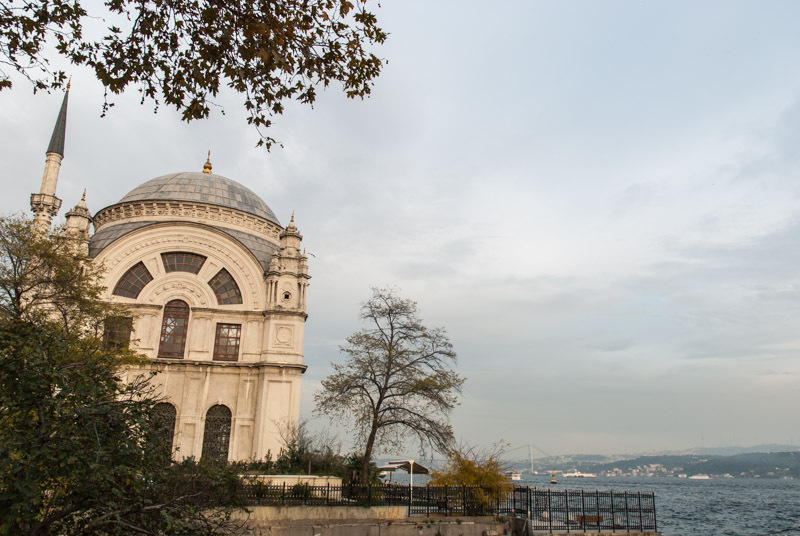 We decide to walk north to the beautiful imperial railway station at Haydarpaşa which was built by German architects at the start of the twentieth century as terminus of the Hejaz and later Baghdad Railways, at a time when both were part of the Ottoman Empire. 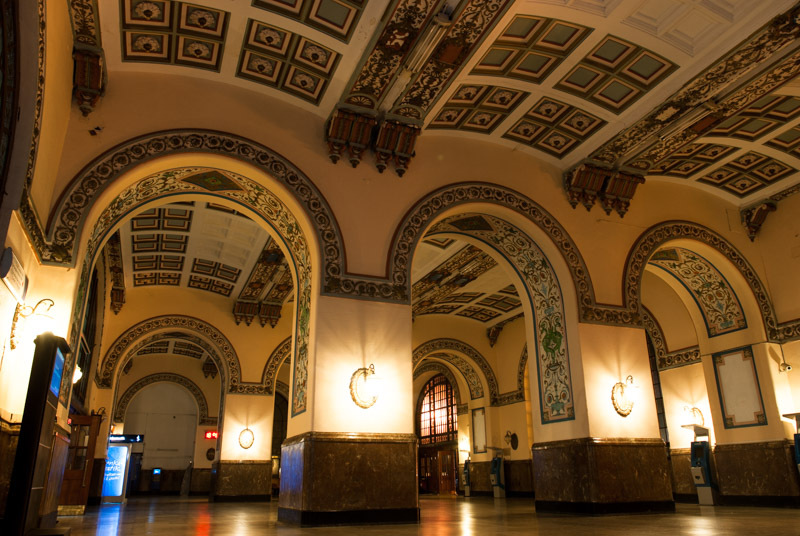 With echoes of a German schloss, the station is a distinctive landmark on the city’s Asian shore, but alas all train services to Haydarpaşa were suspended last year as part of the modernisation of Istanbul’s transport system. Here, I find myself feeling my own sense of Istanbulite hüzün; for the now silent platforms of the station, with its fallen imperial grandeur; for the cessation of long overland rail services; for the fact that both Mecca and Baghdad are practically inaccessible these days, but most of all for the intense nostalgia which overcomes me at revisiting the place where, as an inexperienced youth, I set off on the sweaty evening of the 26th June 2003 aboard the Fatih Expressi to Ankara, thus beginning a life-changing journey across Asia. On our fourth and final day, we focus on the attractions in the very heart of old Constantinople, which is dominated of course by the Hagia Sophia. Built in 537 CE, it was the showpiece of the Byzantine Empire and an unprecedented architectural achievement, remaining the world’s largest cathedral for very nearly a thousand years. 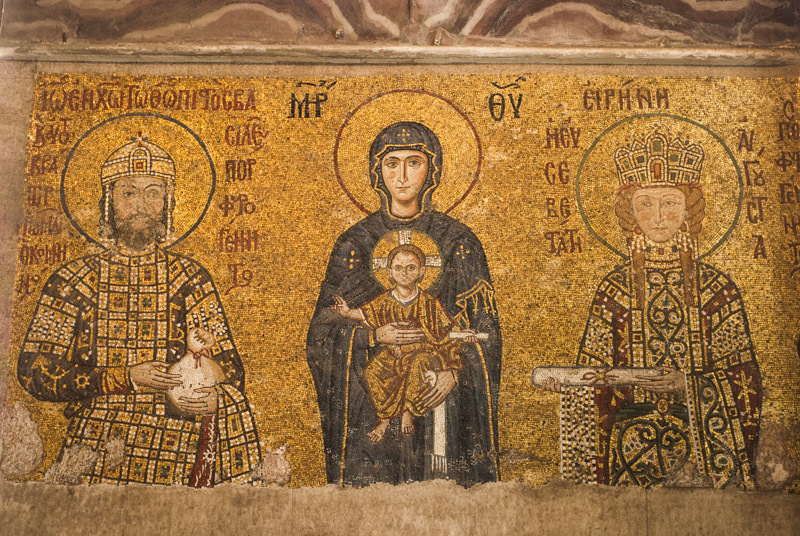 The Hagia Sophia, or ‘Wisdom of God’ was the standard-setter of Byzantine architecture and has influenced thousands of churches which have come after it. From the exterior, the numerous reinforcements made over the years following damage by earthquakes and the addition of four incongruous Ottoman-era minarets rob the structure of some of its grace, and the building, now a secular museum, crawls with tourists, but the interior remains breathtaking. One enters from the old Imperial Gate, which in the past only the Byzantine Emperors, God’s representatives on Earth, could have used. In the tympanum of the entrance is one of many beautiful mosaics, showing Christ Pantocrator, the eternal, omnipotent judge of humanity, with a prostrating emperor at his feet. Other figurative mosaics inside, restored from their cover of plaster from Muslim Ottomans, represent some of the finest examples of Byzantine post-iconoclastic art. 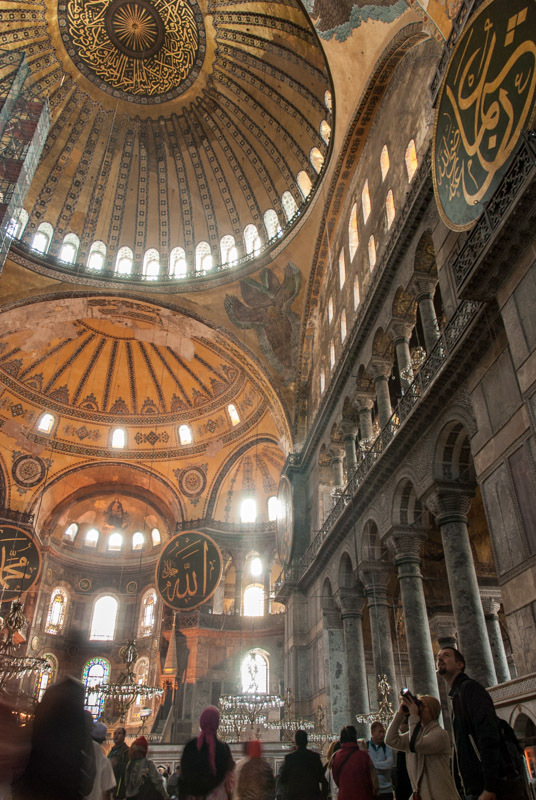 The internal space has been added to many times over the years, including conversion to a mosque, which gives it an unintended eclecticism, but one cannot fail to imagine the awestruck visitors entering the church in Byzantine times, when Hagia Sophia was the eye of the world, the very heart of Christendom. One such group would have been the envoys of Prince Vladimir in Kyiv, who were dumbstruck by the Hagia Sophia’s grandeur and brought back the Byzantine rite which led to the conversion of Pagan Rus’ in 989. When, in 1453 Mehmed The Conqueror entered the Hagia Sophia (after defeating and beheading the childless last emperor of Byzantium, Constantine XI), he ordered its immediate conversion to a mosque, thus ensuring that the building remained an active centre of worship. 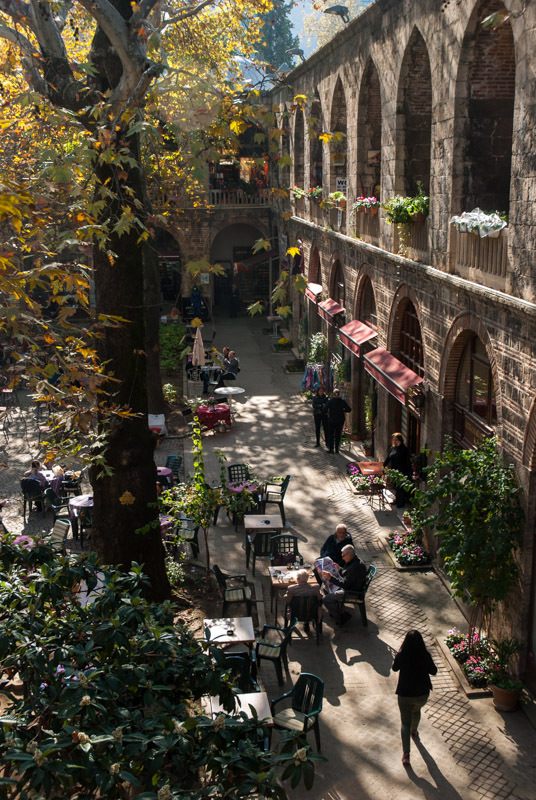 Next, we walk to Istanbul’s famed bazaar, which must have been the focus of activity for even longer than the Hagia Sophia. Here however, I reach my saturation-point of the herds of dawdling tourists; it is clear that the beautiful covered bazaar is no longer part of living Istanbul but an emporium only for the selling of trinkets to tourists and I leave quickly. There is nothing of the real civic ambiance of the great bazaars of Iran. Similarly, walking through the gardens of the Topkapı Palace, famed for the imperial Harem designed to produce many dynastic offspring in the fratricidal society of the sultans, I balk at the tourist hordes waiting to shuffle through the palace. In the evening we stroll in what once was the Hippodrome and is now a square of the same name, marked by two obelisks; one of Ancient Egyptian origin and the other, slightly cruder, Byzantine. The view here, looking across a small park to a side view of the Sultan Ahmed Mosque was among my first, and lasting view of Istanbul in 2003. I feel that on this trip, I’ve seen far more of the city’s great depth of history, but in such a multifaceted metropolis I am very aware that this is a somewhat superficial view, and fully expect to make further journeys in future to this amazing, enchanting, timeless city. Lia flies out in the morning and in the afternoon I cross back to the Asian side to retrieve the truck and drive to the car ferry at Harem in the Asian district of Üsküdar. As I cross the Bosphorus one final time, the sun dips behind grey clouds, reflecting my mood with the upcoming return to dismal Western Europe. Landing at Sirkeci at the foot of the Topkapı Palace is one final romantic vision before I join the frantic traffic. Istanbul’s ugly modern suburbs sprawl for many kilometres, but by late afternoon I’m driving through the undulating fields of Thrace, towards the second Ottoman capital, Edirne. Known to the Byzantines as Adrianople, Edirne was in Ottoman hands long before Constantinople, as the empire moved west from Bursa across the Dardanelles and into Balkan Europe. I’m hosted in Edirne by Gökhan, an ebullient, charismatic student and ardent womaniser who seems to spend far more time luring his female classmates to his apartment than any form of studying, but is a very entertaining host in this grey corner of Europe. I would saddened to hear, eighteen months later, that Gökhan died of a heart attack, aged just 26. Edirne would have been a multicultural city in Ottoman times and today it remains somewhat so, though it now suffers as a border city, choked with lorry traffic and visited more by Bulgarian and Greek shoppers than tourists. Edirne’s centre reminds me already of Eastern Europe with pastel-painted houses, the Grand Synagogue of a mostly departed Jewish population and a general air of fallen empire; a backwater compared to Istanbul. To the west of the centre is the beautiful Gazi Mihail Bridge and külliye but instead of being at the heart of civic life as elsewhere, here the fine mosque is surrounded by a few village houses and muddy, bare fields. All this however pales in comparison to Edirne’s centrepiece; the Selimiye Mosque, built in the time of the rather inglorious Sultan Selim II. 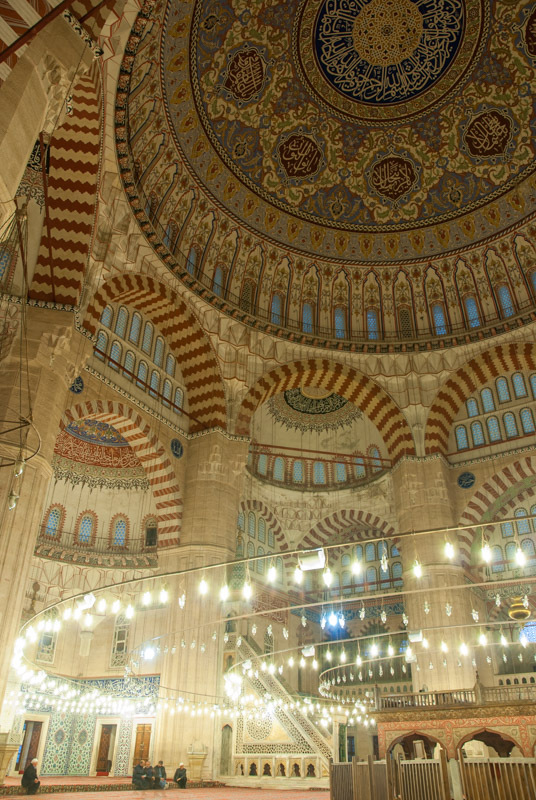 This mosque was Mimar Sinan’s masterpiece, from the ‘Master Stage’ of his long career; larger and more graceful even than the Süleymaniye Mosque of Istanbul. Without a prominent hill-top setting, the mosque’s size is deceptive from the exterior, but the interior is truly staggering. With no tourists around, I sit on the carpet of the mosque and am humbled by the huge, pillar-less internal space, which reduces a human figure to insignificance. 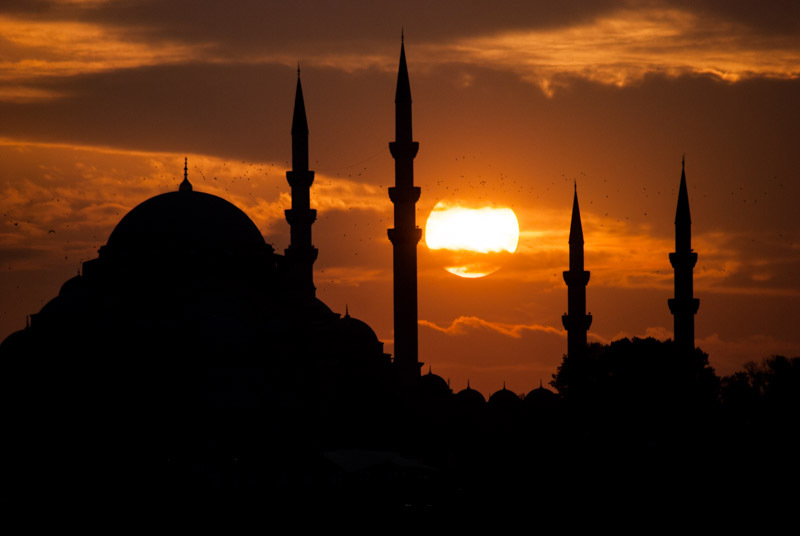 The Selimiye Mosque is one of the great achievements of Islamic architecture and I spend quite some time silently admiring it, filled with a touch of the awe that I first felt in the beautiful mosques of Iran, on that first trip across Asia which started just down the road in Istanbul. I have a rest day in Edirne before saying farewell to Gökhan and driving the last twenty kilometres to the Bulgarian border, where I make an unceremonious exit from Turkey. I return via Bulgaria, a country which surprises me with its beauty and which looks far more like parts of the Former USSR than any other of the Eastern Bloc countries, and where I stay for a night in Sofia with Ivailo, a Bulgarian I had met two months earlier in Yerevan. Then it’s north across the Danube to the quite shocking desolation of western Romania and into Hungary where the bland, over-regulation of the EU starts to show. I break the journey home with stops in Munich, Homburg and Leuven, finally crossing the Channel and returning to my childhood home in Kent on the 23rd November 2014, more than five-and-a-half months after departing, having covered 33,371 kilometres.